Dr. David Albin and his son Dr. Michael Albin of the Hernia Center of Southern California announce the opening of a new practice location in Pasadena after 25 years at their current medical facility. Pasadena, CA — The Hernia Center of Southern California, a practice focused on hernia treatment with offices in Los Angeles, Riverside, and Orange County, will be moving from its current Pasadena location on 800 S. Fairmount Avenue, Suite 419 to 31 W. Bellevue Drive. The first day of business will be July 17th, 2017. 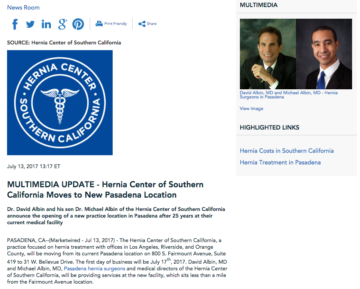 David Albin, MD and Michael Albin, MD, Pasadena hernia surgeons and medical directors of the Hernia Center of Southern California, will be providing services at the new facility, which sits less than a mile from the Fairmount Avenue location. With eight locations to serve patients in the Southern California area, including practices in Los Angeles, Orange County, and Riverside, the Hernia Center of Southern California offers state-of-the-art treatment for hernia repair. Led by Dr. David Albin and Dr. Michael Albin, a father and son team, the medical offices address a comprehensive range of hernia types, including complex and recurring hernias, using an innovative tension-free mesh technique developed by Dr. David Albin. Dedicated to patient care, Hernia Center of Southern California typically offers speedier appointments, less downtime, and a lower risk of recurrence than the average medical facility. To learn more about the Hernia Center of Southern California, please visit herniaonline.com and facebook.com/Hernia-Center-of-Southern-California.